Ron Fattorusso started his career in 1974 as a multi-instrumentalist (all kind of sax and flute) coming from the University of Miami where he had studied jazz. By 1979 he had played for and performed with such stars as Bing Crosby, Shirley Bassey, Steve Lawrence, Edie Gorme, Hal Linden, Joan Rivers, Mitzi Gaynor, Julio Igesias, Celia Cruz,Rodney Dangerfield, Milton Berle, Henny Youngman, Olga Guillo, Willie Chirino, Lissette, Lola Flores, Iris Chacon, Susy Leman, Robert Carlos, Tony Orlando & Dawn, Vicki Carr, Peter Allen and Eddie Arnold. Furthermore he backed Desi Arnez and The Temptations. Since 1980 he is owner of a record studio in South Florida. Since 1990 he is working with pianist Gary Farr but it last till 2004 that he released his first album "Up All Night". His new album "Radio Edits & More" is a special edition of his debut album. "What a nice problem SFR has had with Ron's successful smooth jazz CD. There have been so many great tracks from his debut CD that everywhere we turn, another radio station is playing a different track! So rather than keep sending out singles every few months, we have released a 9 track CD of radio edits and re-mixes for the radio & TV world. We wanted to make some of these great tracks more radio friendly for you and your listening fans. Consider this CD as a great buffet of musical choices for you to dive into!" comments SFR enthusiastically. The album introduces into Ron Fattorusso 's excellent performance with Sands of Time. Conspicuous is Ron's affinity to the Big Band sound. He has often played with Big Bands in the past. The horn section is arranged just in this way. Shuffle Bop follows these path. Great sax melody and horn background. The possibilities of overdubbing are boundless and varied. On Going With The Grain Ron showcases more of his talent as composer and performer. The melody reminds me at the chorus line of the Temptations. Full of sultry harmony. The next two songs are variations of the Latin moody No Es Facil. One can hear the influence of the southern hemisphere. The title tune Up All Night incorporates a sultry melody with a great orchestra of strings and horns. Incredible Mitch Farber's great guitar solo on the end of the song. Mitch is well known as a premier guitarist throughout the music world. Recently Mitch has been working with jazz flutist Nestor Torres. The track Grover, Thanks is a homage at the late sax player Grover Washington Jr.
For friends of reggae Ron has created Jamaican Blue. Certainly a song which would really fit on smooth jazz cruises. I like that sound of steel pan. I know You There is a slow tune with a classic samba rhythm. 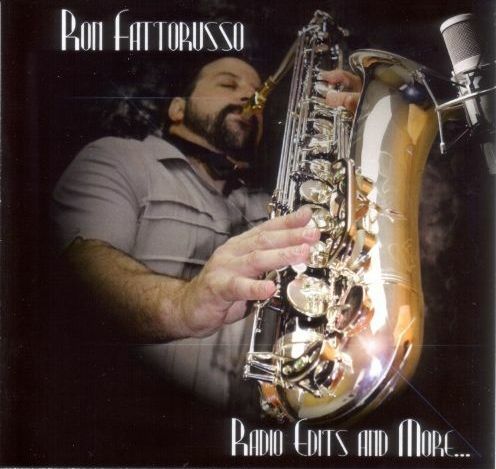 Ron Fattorusso's debut album "Up All Night" respectively its derivative "Radio Edits and More" are for lovers of smooth jazz in the style of great Las Vegas shows.